I finally got the newborn baby bootie pattern out. Its a pattern that I now have for sale on Etsy and Ravelry for $2. Seems to me I've been working on this little pattern for ages! It is really very simple so I'm not sure why it took so long. I have a new found respect for those amazing crochet designers who seem to have another brand new fabulous pattern with multiple sizes out ever other week or so. My pattern just has one size! Here's the process I went through: I made about 5 pairs before I felt like I had a good prototype. Then I wrote out a draft pattern, made another 2 pairs with that pattern, fixing it along the way. Then I sent it out to get it tested - this was an invaluable process that helped me not only with the stitch count and finding little glitches, but also with appropriate formatting, and terminology for UK and Australian crocheters. I was lucky to find an incredible tester (who happens to have a great blog!) who was kind enough to take incredibly detailed notes. I then completely redid the pattern with the tester's notes in hand and finally made one more sample with the final pattern. Yeah! Not done yet . . .
Then, I took a few of the best samples and took them to my cousin's house to get photographed. He's a fabulous photographer with an awesome camera and a great Etsy shop full of beautiful artwork and handmade tables. (Little plug for cousin Mikey!). Finally, I got the pattern up and running on Ravelry and Etsy. Then I immediately sold 2!!! Woot! I was so excited I listed 5 on Etsy thinking that it was going to be a bonanza . . . luckily it wasn't because after all that I found a typo!!! Grrrrr. Long story short, still got 5 for sale on Etsy and I've grossed $4. Still worth it in my opinion for the experience alone. However, I think I'm going to stick with free patterns here for awhile . . . much less stressful. 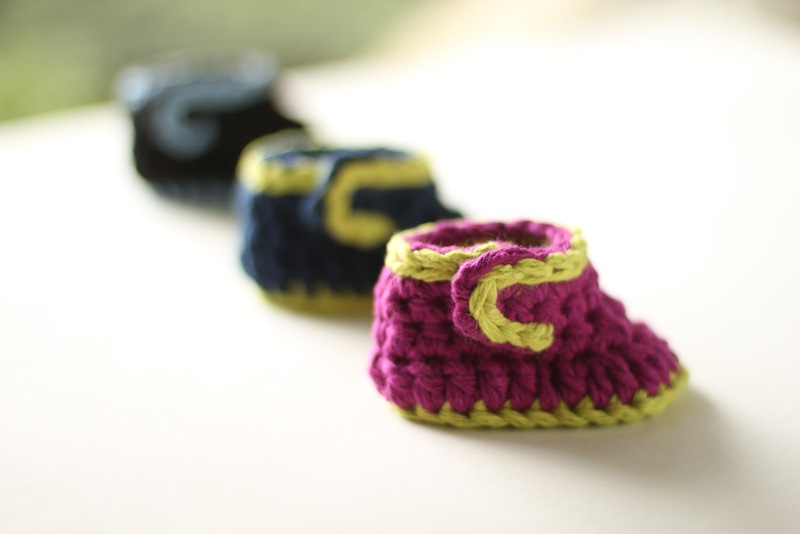 If you'd like your own fabulous newborn baby bootie pattern, you can purchase it on Etsy here or through Ravelry's instant download here (you do not need to be a member of Ravelry to purchase).